Gareth McConaghie celebrates his goal against Larne with his family. Gareth McConaghie says Coleraine have some 'unfinished business' with the Irish Cup. 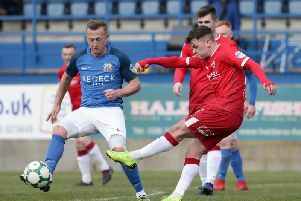 The big defender, who scored the Bannsiders second goal in Saturday's 3-1 semi-final win over Larne, wants to put right the wrongs from last season when they lost to Linfield in the final. "We have a lot of hunger about us as a team," said McConaghie. "We got to the final last year, it was a great day out, but we just didn't turn up on the day. "We have unfinished business with the Irish Cup, but hopefully we can change that this year." It has been an incredible journey for the Dervock man since joining Coleraine from Junior football nearly two years ago. He has become one of the most consistent defenders in the league forming a rock-solid partnership with Stephen O'Donnell at the heart of the Bannsiders' defence. Now he's hoping to cap off a superb season with some silverware. "I stepped up from Junior football and the gulf between that and playing in an Irish Cup final is massive," he said. "It was a learning curve for me, but I'm relishing the thought of May 5th this year. "It's going to be a good game, we always seem to have good tight games with Cliftonville." McConaghie and fellow defender Lyndon Kane were the goal-scoring heroes for Coleraine against Larne. The centre half though felt the Bannsiders did not reach their usual high standards on the day. "I was in the right place at the right time to get the goal," he said. "It was a great delivery from Josh (Carson) and thankfully I was there to put it in. "They scored, but we were lucky to reply almost straight away. If we didn't get that goal who knows how it would have turned out. "We didn't do ourselves justice in the first half. The second half was slightly better, but we know it was a below par performance by us compared to what we have done this season. "We got the win and got into the final though which is the main thing. "We are still in two competitions, but there's still a long way to go, we'll keep chipping away and see where it takes us." The big games keep on coming for Oran Kearney's men as next up they travel to league leaders Crusaders on Tuesday night knowing a win will see them leapfrog Stephen Baxter's side. "We're looking forward to Tuesday night, those are the sort of games you want to play in," said McConaghie. "We have a great squad of boys, and Oran and the backroom staff had done a great job. "It's all to play for and we are going in the right direction. "We will still be taking it one game at a time though and see where we end up. "We are enjoying it, you never know with football what is going to happen so you have to enjoy it. "Everyone wants to beat ourselves and Crusaders because of where we are. "Our record speaks for itself in terms of how good we're doing this season and how far we've come, long may it continue."